Other photos: Manufacturer Provided Image: Salon, Manufacturer Provided Image: Salon, Manufacturer Provided Image: Dining, Manufacturer Provided Image: Galley, Manufacturer Provided Image, Manufacturer Provided Image: Engine Room, Manufacturer Provided Image: Forward Stateroom, Manufacturer Provided Image: Forward Stateroom Head, Manufacturer Provided Image: Forward Stateroom Dress, Manufacturer Provided Image: Aft Stateroom, Manufacturer Provided Image: Aft Stateroom, Manufacturer Provided Image: Port Cabin, Manufacturer Provided Image: Stbd Cabin, Manufacturer Provided Image: Deck Layout, Manufacturer Provided Image: Saloon Layout, Manufacturer Provided Image: Accommodation Layout. 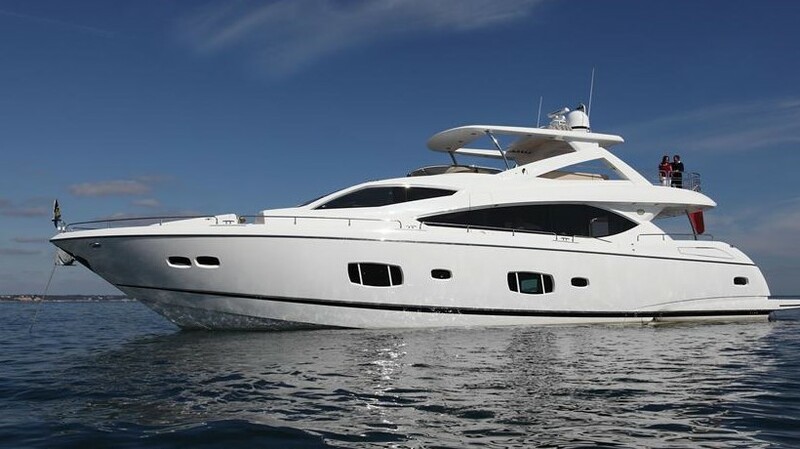 LILY VENTURE is a lightly used 82 Sunseeker Yacht with low hours on the desirable 1550 hp Common Rail MAN's. Accommodations for 8 with 4 Staterooms and 3 Heads w/showers plus crew aft. Shows like a boat half her age.